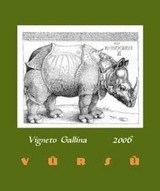 The 2006 Barbaresco Vigneto Valeirano is another exuberant wine. Here, too, the aromatics literally jump out of the glass, as layers of perfumed super-ripe fruit are intermingled with a persistent vein of minerality. The powerful, focused Valeirano offers outstanding balance, but needs a few years in bottle for the tannins to melt away. Anticipated maturity: 2011-2021.